I do enjoy writing for the farm. Not only do I Iove developing and preparing the recipes, I adore eating the fresh, delicious produce. However, sometimes I feel like I am working in the dark, as feedback from my readers is scarce. Please take a minute to share your opinion on the blog. I would love to know if the write-ups are relevant, informative, and useful and if the recipes are helpful. Only with your feedback can I be sure I am meeting your CSA needs. There is something truly irresistible about little round food. Give it a name like “Kermit” after Kermit the Frog, and you really have something compelling. Such is the case with the adorable little Kermit eggplants that will be coming to us from the farm this week. Kermit eggplants, sometimes called Garden Egg or Bitter Ball, are an American born hybrid of the round Thai eggplant. 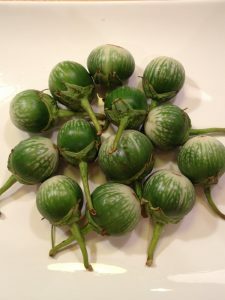 Kermit and Thai eggplants differ from other eggplants not only in their shape and size (round, golf ball shape typically between 1-2 ½ “), but also in that they can be eaten raw. In Asian cuisines, they are eaten raw in certain salad preparations, but are also cooked, typically in curry-like dishes where they tend to hold their shape quite well. Thai eggplants can be white, green, purple or yellowish and tend to have tender edible skin and meaty flesh that is quick cooking and that soaks up flavors in food well. Like their namesake, Kermit eggplants have deep green “shoulders” with a bit of white on the bottom end. The jagged shoulders really do remind one of Kermit’s adorable webbed feet. Like other eggplants, Kermit eggplants hail from the nightshade family and are quite nutritious, being high in fiber, potassium, Vitamin K, Thiamine, Folate, and Manganese. They are also low in calories and saturated fat, and contain a decent amount of protein. Because of their small size, Kermit eggplants require a little ingenuity in the kitchen. Traditionally, folks seem to simply slice them into rings or quarter them before cooking. There is no need to peel or “sweat” these kind of eggplants. They are wonderful in stewed dishes like curries or ragus (see recipe below for a Tomato and Kermit Eggplant Ragu). They are also delicious simply stir-fried with your favorite sauce. Choose eggplants that are firm, glossy, and heavy for their size. The calyx should look fresh and cling tightly to the eggplant. The shelf life of Kermit eggplants is typically shorter than other varieties. Once picked they should be refrigerated in plastic, where they last only about 1 week. Karen informed me that these sweet little eggplants are a new “experiment” for the farm, so not a lot were planted. I understand that our shares may contain only 3-4 of them, so my recipe development focused on using only a few at a time. But if you get a chance to get your hands on more of these special eggplants, please share your recipes with us! This recipe is highly versatile. Make it as is, or add some zucchini or summer squash for more heft (cut the squash approximately the same size as the eggplant pieces). If you add more than one squash, I would increase the amount of tomato, tomato paste, and broth. For variation, add curry powder or garam masala. Serve over polenta or pasta or eat alone as a side dish. Heat olive oil over medium heat in a medium saucepan until hot. Add onion, fennel and garlic and cook, stirring occasionally, until onion and fennel is soft, about 8 minutes. Add tomato paste and cook, stirring constantly, until tomato paste is darkened and caramelized, about 2-3 minutes. Add tomatoes and eggplant and cook, stirring occasionally, until tomatoes begin to give up their juices, about 4 minutes. Add broth, salt (if using), and sugar. Cover and cook 15 minutes or until eggplant is tender. Uncover and cook to reduce and thicken sauce to your desired level. When I first saw these sweet little Kermit eggplants from the farm, I couldn’t get the idea of little stuffed appetizers out of my head. Voila, stuffed Kermit eggplants. This recipe makes enough stuffing to fill about 6-7 Kermit eggplants. If you don’t have that many, you can always use the leftover stuffing in mushrooms, globe or Japanese eggplants, summer squash, or zucchini. 1. Preheat oven to 400℉. Bring a medium pot of water to boil on a stove. Fill a medium bowl with cold water. Cut off stem end of each Kermit eggplant. Cut each eggplant vertically in half. Cut a very small slice off of one side so that eggplants will sit stable in a baking pan. Using a melon baller, scoop out the centers of each piece of eggplant. Place scooped out bases in cold water. Chop centers finely and add to onion and garlic mixture. Remove eggplant bases from cold water and blanch 3 minutes in boiling water. Drain. Rinse thoroughly with cold water to cool. Set aside. 2. Heat a heavy non-stick skillet over medium heat. Add sausage links, and cook, breaking up in to small pieces as you go, until browned. Add onion, minced eggplant, garlic, and thyme. Cook, stirring frequently, until onion is soft, about 5 minutes. Remove from heat and allow to cool. Stir in breadcrumbs, Parmesan, and 1 tablespoon of extra virgin olive oil. Mixture should hold together when pinched between your fingers. If it doesn’t, add a little bit more olive oil. Season stuffing with salt and pepper to taste. 3. Dry eggplant bases with paper towels. Place in an 8 X 8-inch baking dish sprayed with olive oil spray. Divide filling between eggplant pieces, pressing gently to mound high. Drizzle with remaining 1 tablespoon olive oil. Spoon wine around pieces (but not on top). 4. Cover tightly with foil and bake 15 minutes. Remove foil and bake until eggplant pieces are tender and tops are golden, but the bases still hold their shape, about 10 minutes more. Allow to cool for 5 minutes. Squash ribbons are a new, trendy way to serve zucchini and summer squash. The ribbons are great raw or sautéed. This version uses raw summer squash ribbons in a refreshing lemony summer salad. Zucchini can be used as a substitute for summer squash, if desired. 1. Blend lemon zest, lemon juice, vinegar, shallot, and olive oil until smooth and emulsified. Season to taste with salt and pepper. 2. Using a “Y” peeler, peel long strips from summer squash, going from top to bottom. Place strips in a medium bowl. Continue cutting strips all around the squash until you get to the seeds, at which point stop cutting. Reserve remaining squash flesh with seeds for vegetable stock or another use (e.g. shred, saute, and puree the squash with marinara sauce to boost its nutritional value—the kids will never know). 3. Toss squash strips with dressing to taste. Sprinkle with pine nuts and basil. Toss again and serve. I LOVE your blog, Julie – keep it up! I LOVE your blog posts. I have made most of your recipes with great success. The recipes are simple and very easily adaptable to individual family tastes (for example i tend to put basil in EVERY recipe in the summer) I didn’t even read past your comment today about feeling like you are writing in the dark. I needed to respond to tell you your posts are AWESOME and timely and fun and easy and capture my love for the farm and the produce perfectly! Don’t stop posting, you are definitely not alone! I made a version of the ragu with last week’s share – the eggplant, onions, squash and tomatoes. I should have thrown the fennel in, too! I love the info on the veggies and the new recipe ideas. Thanks! I like reading the descriptions of vegetables I am not familiar with, and getting an idea of how to use them, even when I don’t use the recipes. I have never seen or eaten a Kermit eggplant and I wouldn’t have known that they may be eaten raw, for example. Julie – LOVE your blog! I look forward to it because you are an excellent, entertaining writer. The content is educational, informative, and always excites me about the week’s offerings at Holcomb Farm. I print out your blogs and always try one of your recipes. Keep up the good work! We are so thankful for your blog! Write on! I am eating an 80% raw vegan diet so I especially appreciate your creativity when you include raw recipes like the summer squash ribbons. Thank you, Julie! Thank you all for your comments. I will try to continue to stay “Simple”, at least most of the time, and to experiment with new things, including raw recipes. Please feel free to share your favorite recipes with our readers here on the blog. Holcomb farm’s harvest has always been a great welcome to our table, even if we didn’t really know what to do with many of the offerings. But now, with the guidance of Julie’s wonderful blog I feel that our enjoyment of the vegetables and our “farm to table” experience have reached a new level of appreciation. Thank you for your posts. I just got home from my visit to the farm. It is such a relaxing routine for me on my Saturday mornings. I am raising three teenage boys, and this has been my therapeutic time for me. The bees were buzzing all around the tomatillos and the zinnias were standing ever so handsome by their side. My car smelled wonderful on my drive home. Too bad Yankee Candle couldn’t come up with that scent. They could call it “Farm Fresh” . I am making a tomato tart, and your salad for dinner. If the tart comes out well, I’ll post the recipe. And just maybe some Kale chips for snacking. Looking forward to your next posts. Thanks so much!! Julie, I’ve told you this in person, but I use many of your recipes with good results. I really appreciate new ways to cook vegetables – just made the shredded zucchini cakes with adobo sauce. Yum! I sometimes modify because my husband’s a vegetarian, but do appreciate the recipes with meat as well. I work during Tuesday distribution and can guide folks to your blog directly when they’re mystified by a new vegetable (like the Kermit eggplant). Keep it up, thanks!